Crime pays – in the movies at least. Filmgoers have long been obsessed with the lives and crimes of career criminals, from honourable family man Don Vito Corleone in The Godfather to the coke-fueled paranoia of wise guy Henry Hill in Goodfellas, and what drives them to commit their evil deeds. 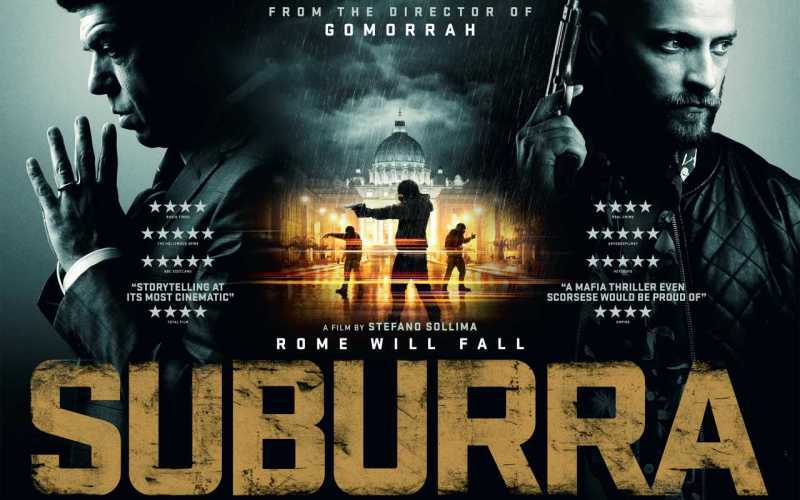 We’ve not been deprived of great crime thrillers over the past few years, but Suburra, an Italian crime thriller from Stefano Sollima (who directed the brilliant Gomorrah TV series), could well be the best of them all. Suburra is set in a Rome waterfront town controlled by corrupt politicians and criminals, who are colluding to turn the town into a Mediterranean Las Vegas. It’s an ugly underworld of violence and corruption, where morals have gone out of the window and money and power rules all. To make matters worse, Italy itself is falling apart too. The government is collapsing under the weight of its corruption, the Pope is planning to stand down and record rainfall threatens to burst the banks of the Tiber. Suburra follows two key players: Italian MP Fillippo ‘Pippo’ Malgradi (Pierfrancesco Pavino) and Mafioso Samurai. Their plans for Suburra are thrown into disarray when Pippo is blackmailed after a night of debauchery with an underage prostitute ends in horrific circumstances, sparking a chain of murders, violence and corruption. It’s a complex, twisting tale that explores the lives of criminals and the corruption within the Italian state. There are no heroes here, just amoral and dishonourable characters that would make Don Corleone choke on his oranges. With expert direction from Sollima, a superb screenplay by Stefano Rulli, Sandro Pertraglia and the authors of the source novel, Carlo Bonini and Giancarlo De Cataldo and a soundtrack by M83, Suburra is as stylish as it is compelling. Rome has never looked so dangerous. If you love Goodfellas, The Sopranos or pretty much any mafia movie, there’s plenty to love here. Even if you aren’t normally into crime thrillers, you may like Suburra too; beyond the ultraviolence and the seedy corrupt dealings between gangsters and politicians, it’s a story about normal people driven to extraordinarily dark actions by a lust for power and wealth. Suburra received rave reviews from critics when it was released earlier late last year, with Empire calling it ‘a Mafia thriller of which even Scorsese would be proud’. Intrigued? Pre-order Suburra from the musicMagpie Store now using one of the links below! We’re also giving away a signed Suburra poster over on Twitter. Simply follow @musicMagpie and RT the tweet below for your chance to win!